Easygoing, welcoming and oh so cool – Melbourne’s personality isn’t found in grand monuments, but in its coffee houses and alleyways. Australia’s second city is sure to charm you. It’s impossible to get a bad cup of coffee in Melbourne – at least that seems to be the case in a city that is very serious about its black brew. There seems to be an unending supply of great little coffee shops dotted around Melbourne’s streets and alleys, and visitors are advised to try as many as they can: St Ali in South Melbourne, The League of Honest Coffee downtown, Slowpoke in Fitzroy – the list goes on. Of course, the coffee house experience isn’t just about the stuff in the cup, but a vital slice of Melbourne life. Sitting at the edge of the world on Australia’s south coast, the second-biggest city in the land Down Under knows how to kick back and enjoy itself. Breakfast is a serious affair, with many locals getting up early just so they can enjoy some time in a cafe before work. Later in the day it’s all about the outdoors, starting with cycling or kitesurfing at St Kilda beach, and ending with a neighbourly barbecue. Visitors to Melbourne will find a city that is welcoming and easy to like. The weather is mild but changeable, often moving from hot to cold and back again within the same day. Downtown Melbourne, is easily walkable, although the city is also home to the world’s largest tram network. Hop on one of these to visit the seafront promenade in St Kilda, or to browse the vintage outlets and design shops of Fitzroy. The Dandenongs mountain range is easily visited on a daytrip from the city, with highlights including the Healesville Sanctuary. This park offers the chance to get close to Australian best-loved animals like kangaroos, koala bears, dingos and emus. The Dandenong Ranges National Park is a natural beauty, with mountain ash trees, fern gullies, and native birds such as kookaburras and lyrebirds. The Great Ocean Road is one of the world’s most beautiful scenic drives, and Melbourne makes a natural starting point. A highlight is the Twelve Apostles, a series of limestone stacks sitting just off the coast, near Port Campbell. Long-haul visitors may even find it’s worthwhile hopping over to Sydney, it’s only a two-hour flight from Melbourne and local carriers cover the distance several times a day. In the capital, the Sydney Opera House and the Harbour Bridge will provide some of the more obvious photo opportunities that Melbourne lacks, although locals would argue Melbourne more than makes up for this with its free-spirited atmosphere. Travellers with children will enjoy Melbourne’s ArtPlay, a free creative arts studio for children and their families in Birrarung Marr park. The Melbourne Museum is dedicated to the Victoria region, with particular attention paid to its natural history. The section devoted to living bugs of all shapes and sizes may thrill kids more than adults, but everyone will like the butterflies. History buffs may be interested to visit Captain Cook’s Cottage in Fitzroy Gardens; this cottage belonged to Cook’s parents back in England and was shipped over to Melbourne in 1934. No one should miss the Ian Potter Museum, which has an impressive collection of Australian art, including an interesting section of indigenous Aboriginal art. Melbourne won’t leave you hungry, with plenty of restaurants and styles of cooking to choose from. Dinner could consist of meat from a local animal such as an emu, kangaroo or crocodile, or a barramundi or John Dory fish. Locals will often suggest going for dumplings, offered in style at the Hutong Dumpling Bar or another of the city’s numerous excellent South-East Asian restaurants. Or just grab a couple of sushi handrolls from a hole in the wall; you’ll find these all over the city. Then maybe a Flat White coffee and a slice of Pavlova cake to round it off? Or a Bundaberg ginger beer, a local non-alcoholic favourite. It’s all a bit mix-and-match, but that’s Melbourne for you – the city has a bit of everything. Posted on 07/03/2014 by Jess. 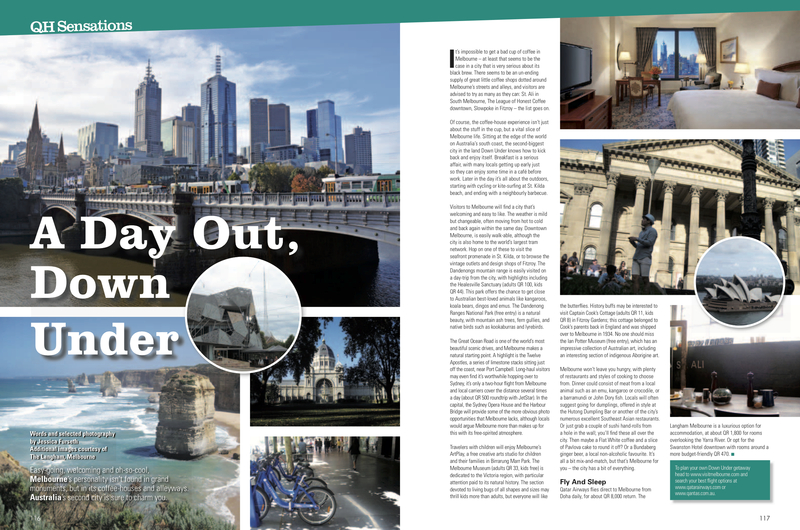 This entry was posted in Travel writing and tagged australia, melbourne, travel. Bookmark the permalink.